The sculls are at an angle with respect to the axis perpendicular to the boat. 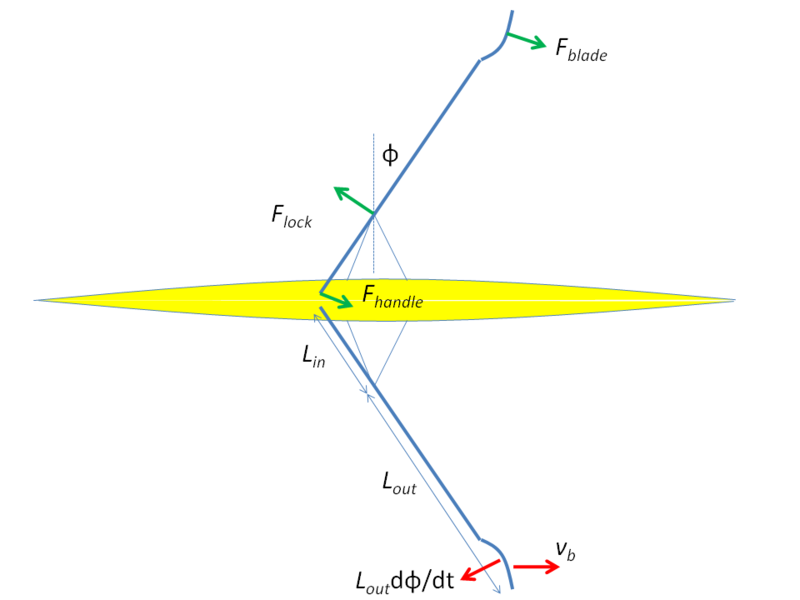 The resulting blade velocity in the water has two components, a component because of the boat velocity, and a component due to the angular velocity of the scull. The blade/water interaction results in drag and lift forces on the blade. The basic equations are explained nicely by Marinus van Holst, so I will just give a summary here. Basically, the harder the rower pulls, the more the blade slips. In light rowing, there is almost no slip, and the angular velocity of the scull is such that the blade remains at the same location in the water. When the rowers pull harder, this is result in a slip, such that the blade force equals . where A is the blade area, , the velocity component perpendicular to the scull shaft, is given by and , the component in the direction of the shaft, is given by , and the “angle of attack ” is given by . For , I use a value of 1.0. Note 2011/04/15: Removed from the lift and drag force equations. See discussion below. This entry was posted in rowing physics, Uncategorized on July 12, 2010 by sanderroosendaal. In your equations for Fl and Fd you have the angle of attack. Isn’t the influence of the angle of attack already absorbed in the coefficients Cd and Cl? Martijn, I’ll look into that as soon as I have some time. I don’t have the references at hand now. I’ve been busy so I didn’t have too much time to look into this. However, the component represents the projected blade area in the direction of fluid flow. In ref. , Caplan and Gardner discuss the modelling of lift and drag components as a function of angle of attack. It is clear from their discussion, that they use the same definition of and is is used on this site. They find an additional dependence on angle of attack on top of the projected blade area dependence, which can be approximated well by the and behaviour that I use in my model. So, yes and no to your question. Yes, the influence of the angle of attack as modelled by Caplan and Gardner are absorbed in the coefficients. No, the influence of the projected blade are is not absorbed in the coefficients. I agree that just stating ‘the projected area’ isn’t very clear. In some other article they define the area, A, more precisely. You are right, Martijn. I’ve been going back to the basics in order to understand the discrepancies in this post. Bill Atkinson pointed me to the same issue in a discussion on the comparison between models. I have now corrected it and will – in the course of the next weeks – go through my old simulations and gradually update the site. Thanks for pointing this out. I am sorry it took me such a long time to figure it out.